Believe it or not, the English make sparkling wines. It’s not a huge industry but it’s growing, and some of it is considered very good – so good, in fact, that in a recent issue of the World of Fine Wine Tom Stevenson and his panel of specialists tasted English sparklers against champagnes blind. Which is saying a lot. English sparkling wines (typically made in the southernmost counties, mainly Sussex) again competed with champagnes in the Judgment of Parsons Green (February 2013, see Tom Stevenson’s detailed evaluation here) and, well, the top medals all went to English wines. To be more precise, three out of the top four wines were made by Ridgeview Wine Estate. And so when I was looking for a winery to visit in the UK, the choice seemed obvious. Let’s go to Ridgeview. 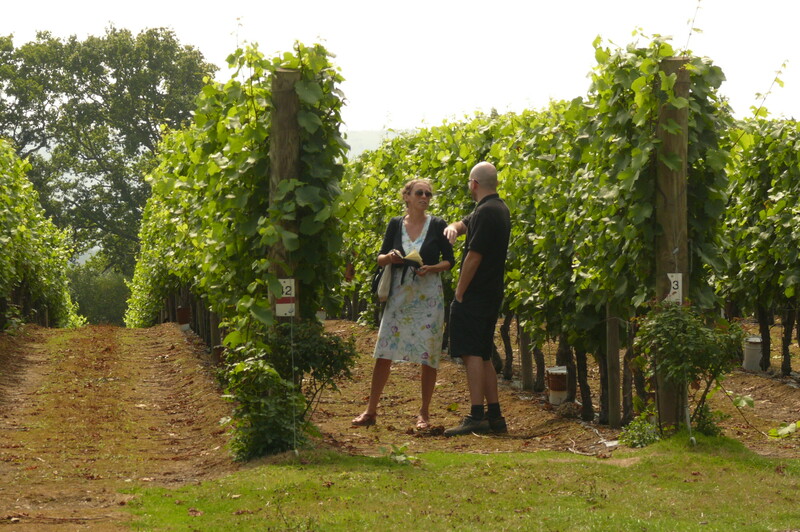 This small, family-run winery is located just north of Brighton in the beautiful South Downs. Surrounded by a meticulously tended Chardonnay vineyard, the winery building is rather industrial-looking but the warm welcome from marketing executive Oliver Marsh makes up for the absence of a stunning chateau. And anyway, I’m more interested in the gyropalettes than any aesthetic niceties. Gyropalettes are a very clever invention, they come from Cava-producing Spain and are now used pretty much everywhere in traditional method sparkling wine-making. As you can see in the photo here, they are large metal structures that hold hundreds of bottles of wine. When sparkling wine is made the traditional (i.e. Champagne) way, the rules of which are strictly set, the still dry wine has to undergo a second fermentation in bottle. This fermentation is triggered by the addition of tirage, a mixture of yeast and sugar. As fermentation takes place and the yeasts eat the sugar, CO2 is produced as a by-product, and since the bottle is sealed, it can’t escape. This is how champagne gets its bubbles. When fermentation is over, the dead yeast cells (called lees) are also stuck in the bottle, and this is good because after a while they begin to decompose and add exciting, complex flavours to the wine (this is called autolysis). However, when the producer wants to sell the wine, he wants to sell a clean product and so these dead leftovers need to be removed. The first stage of the removal process is riddling, or remuage in French. And here is where the gyropalettes come into the picture. Traditionally riddling was done by humans. The bottles were placed in A-shaped racks called pupitres, at such an angle that the neck of the bottle was slightly lower than the bottom. 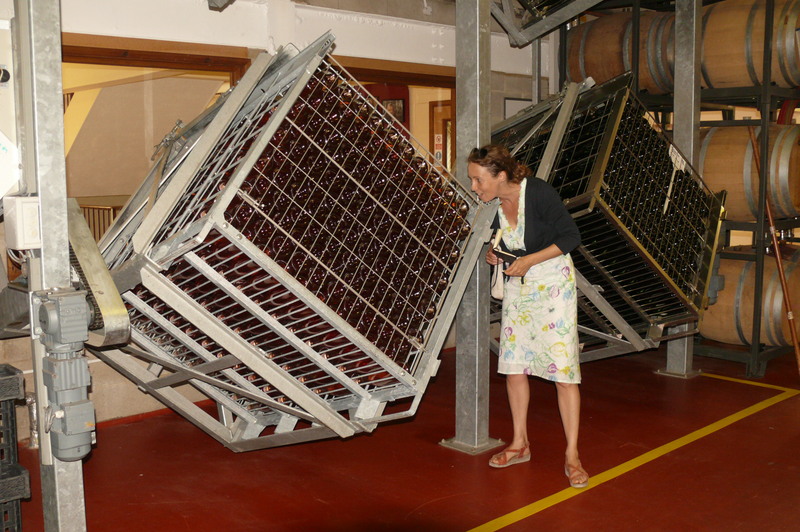 Every day the remueur would come and give each bottle a little twist and shake, and gradually increase the angle. After a few weeks the bottles would be almost completely upside down, and as a result of the shaking, the lees would now be sitting in the neck of the bottle. So, I asked, what’s all this fuss, why can’t you just shake once, but shake properly, and get it over and done with? It turns out that the lees are actually stuck to the side of the bottle so it takes them a longer time to travel down to the neck. But the great thing about gyropalettes is that they speed up this process, from weeks to only a few days. Oliver tells me five days at Ridgeview. And since no human labour is needed, it makes things a lot cheaper. After I’ve sufficiently familiarized myself with the intricacies of riddling, we go and see the vineyard. It only produces a fraction of the grapes used by Ridgeview, and only Chardonnay is planted here – the rest of the grapes, including Pinot Noir and Meunier, the traditional champagne varieties, come from further away, but all are grown on nearby lands so the soil and climate will be similar. The bedrock is chalk, with up to one metre of clay top soil. 2013 has been a great year weather-wise, Oliver tells me, and so they’re expecting excellent quality fruit at the harvest, which is to begin some time in early October. The grapes are hand-picked at perfect phenolic ripeness, which means that they will have lost all green, unripe flavour components. 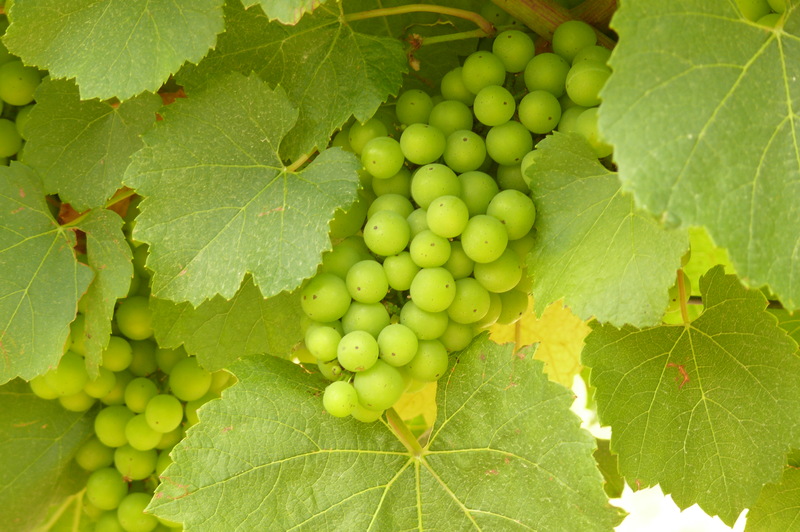 The harvest can thus take up to three weeks as grapes in different parts of a vineyard will ripen at different times. The bunches then undergo gentle whole-bunch pressing in a massive pneumatic Coquard press. Only the free-run juice is used in the production of the base wine. By mid-November the base wines are ready. They undergo malolactic fermentation throughout the winter, and blending takes place around February. Sparkling wines are typically blended, as they are made up of several grape varieties unless blanc de blanc (only from Chardonnay) or blanc de noir (only from Pinot Noir) is being produced. The second fermentation, described above, takes place over 30 days in the dark cold room, and after this is finished, the wines are left on their lees for two years before degorging (the removal of the lees from the bottle). Ridgeview was established in 1994 by Mike Roberts and his wife Chris. Today their children also work in the winery, which employs ten people altogether. The atmosphere is warm and friendly, relaxed, and the tasting room is open to visitors almost every day of the week (from 11 to 3). Ridgeview’s style is young, fruit-driven wines in which acidity is balanced with autolytic and fruit flavours. Their wines are mainly sold on the UK market, with about one-fifth being exported. They also produce sparkling wine for retail giants Marks&Spencer, Waitrose and Laithwaites. I taste three wines, all from the 2010 vintage, their most recent one now available. Grosvenor is a pure Chardonnay, bone dry wine with lots of minerality, high acidity and green apple flavours. Cavendish is more mellow, with autolytic notes and raspberry fruitiness. It’s a blend of Chardonnay, Pinot Noir and Meunier. This is Ridgeview’s flagship wine, Oliver tells me. And then we taste the Fitzrovia Rosé, which has an intense strawberry nose and on the palate good acidity with lots of sweet fruit and a bit of toastiness. My favourite is the Cavendish, though each wine is well made and has its appealing characteristics. Since my visit I’ve been looking in wine shops, and you won’t find Ridgeview on every Tesco shelf but it is available, for example on the Wine Society’s website or in specialist shops, but also from Waitrose Direct. 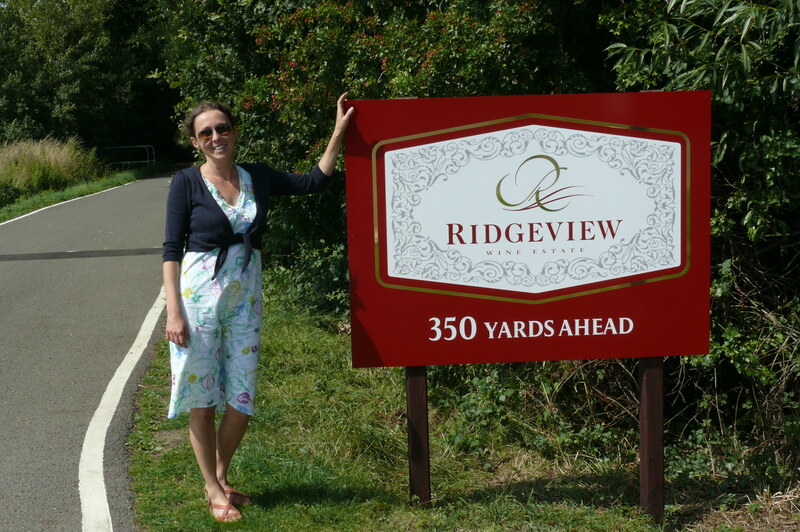 To find out more about Ridgeview visit their website.